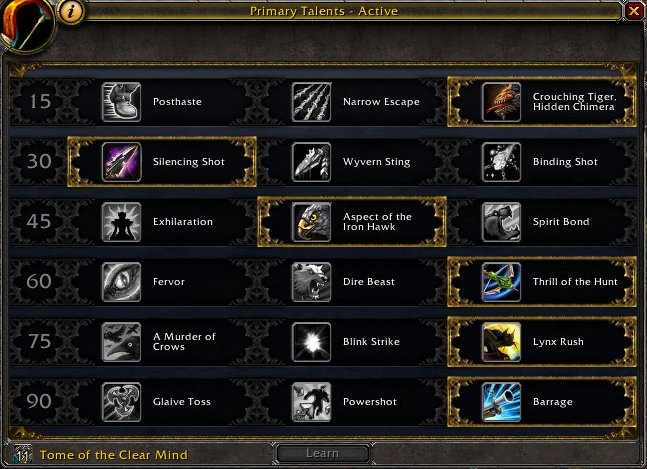 Level 60 and 90 talents are vital. First my disclaimer: I've only killed him once and it was close. Well actually the previous attempt we got him down to 0.01% health so that was closer. But you get the idea. I'm not an expert. And everyone's raid needs are different. But I am able to do 150-170K dps over the course of the fight so I do have some advice to share. Now let's talk talents. You want to be doing this fight as Survival. Serpent Spread is just too useful here. I have done a lot of tinkering with trying to optimize Beast Cleave for BM, but it really doesn't compare. As Survival and AoE heavy, you want to take Thrill of the Hunt. You'll be doing a fairly ridiculous number of multishots and it doesn't hurt to make that easier. And if it procs when multiple targets aren't around, regening focus while tossing arcane shots isn't bad either. You also really really want to take Barrage. The cooldown on it is perfect for it to be available once for every bat phase. Can you tell when the bats are out? Now since I just mentioned a boss mechanic, let's talk about some fight info. Most likely, you'll need to be misdirecting bats to a tank so they don't insta-kill your healers. This means you have to do it with a misdirected multishot or a barrage. You want to always have some focus for this. I was running with another hunter in our 10man so we split into sides of the room. If you're by yourself, you may need to be closer to the middle. The reason is that it seems like the bats don't always spawn within range of all locations. The other trick is that there isn't a very good timer for when the bats really appear. So you'll want a targeting macro you can slap a lot.